Average Weight	: 35 - 45 lbs. The Sussex Spaniel is a fairly rare breed. It was developed in the 1800s in Sussex, England. It is a small-game hunter and companion dog. The breed was probably developed from crosses of spaniels with hounds. The dogs were used as field hunting dogs. Their slow pace along with their fine nose, good strength and stamina made them popular for hunters on foot flushing and retrieving upland game. Sussex spaniels got their name from their place of origin, which is Sussex of England. They were developed as a separate breed during the 1880's by Mr. Fuller of Rosehill. He used these dogs as work dogs and kept the same line for 50 years. However, this breed of dogs was almost extinct during the World War II. Breeding was discouraged during that time, and only one person in America was able to continue the Sussex spaniel line. Since 1945, Joy Freer successfully kept the line alive, and all her Sussex spaniels were kept for the sole purpose of saving the pedigree. However, she also experienced breeding problems around the 1950's, and the attention shifted back to the UK where original lines could still be found, though very few in numbers. Currently, the Sussex spaniels are considered a very vulnerable breed. Sussex spaniels are known to be a very friendly breed towards humans as well as other animals. This type of dog can easily get along with children, other dogs and even cats. Although some of them can be aggressive with new dogs in the environment, they will usually calm down once they sense that there is no significant threat. Gentle and friendly as they are, Sussex spaniels are known to be experts in retrieving small games and they bark a lot while on the hunt, which shows their great enthusiasm for hunting. These dogs are generally very smart, and they have the ability to catch new concepts fairly quickly. Though they are highly teachable, you have to be firm when teaching or instructing them, or they will not respond with obedience. They also have the tendency to do things on their own and discover new possibilities for a particular task. Sussex spaniels love human company as they are very sociable, and they are particularly loyal to their owners. They are not known to show aggression towards ordinary humans, even to strangers they meet for the first time, but if they detect any suspicion or threat, they can be quite ferocious. The Sussex spaniel is known as the best watchdog among spaniels. When they are not in the environment of threat, they can be quite adorable as they have the habit of sticking their tongues out most of the time. These dogs also adapt well to different environment, and they seem to know how to behave themselves in different locations. When they are indoors, Sussex spaniels are very calm, almost without any hint of liveliness. However, once they are taken outside, they immediately come to life with lots of jumping and running around, and they will participate in everything you order them to do, with great excitement. These dogs, however, can be rather stubborn at times, and they will only obey firm command. Sussex spaniels also tend to be clingy and they try to be within short distance of their owners. When their anxiety is aroused, they can be quite rowdy, howling, barking and even breaking things. Since these dogs can be quite unpredictable, they should not be left alone in the house when you are going out or they may mess up the whole place. These temperaments are present in all adults that are not properly trained. 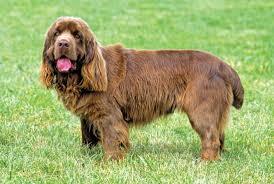 Proper care and training will ensure that the temperament of your Sussex spaniel will be well controlled. Sussex spaniels can easily become overweight. Therefore, regular exercise is compulsory for this breed. A regular two mile walk is the minimum requirement to keep the dog's fitness level in check. If you are living near the woods, get the dog some good exercise by taking it for strolls in the woods. You can also train your Sussex spaniel to retrieve small games, which is a cause for excitement for this breed. When in the outdoors, it will mostly follow you wherever you go, but keep in mind that it has a very good nose and will probably wander off in search of anything that has an interesting scent. Sussex spaniels are very friendly, and they are very eager to interact with other dogs in the park or in the woods. Use a leash when you bring them outdoors, as they can get quite out of control when they are excited. But even if they wander off to somewhere else, they will eventually show up beside you as you continue with your own exercise. Sussex spaniels are also great swimmers. Taking your dog for a swim at least once a week will also do wonders to its physical condition. If you are planning to let the dog participate in retrieval competitions, a well rounded exercise schedule and retrieval practice will just about get your Sussex spaniel ready for action. Sussex Spaniels are very active dogs, and they love all kinds of activities. Training is practically a breeze because these dogs are known for their physical prowess and stamina. Their intelligence and willingness to explore new concepts make them very easy to train. The ideal training ground for Sussex spaniels is a fun environment with lots of interesting activities. If you manage to make the training session exciting, these dogs can typically pick up any notion or skill you wish to impart to them. Spaniels are generally very playful, and they are open to learning anything that appeals to their interest. On the other hand, if you frustrate or make them anxious, they will be impatient to any kind of training or activity. When they are in a good mood, they are so easy to train that you will not even need the service of a professional trainer. You can train them to adopt simple manners and obey simple commands, such as sitting, staying, rolling or retrieving. While they are rather well-behaved under normal circumstances, there are other areas where a Sussex spaniel needs some discipline. Due to their curiosity and impulsiveness, there are times when they can be quite difficult to control. However, if you are patient enough, you can train Sussex spaniels to do quite extraordinary things. For example, you can train them to bark once when someone is at the door and twice when they need to go outside and so on, though these habits require great patience to instill. Yet for simple manners, Sussex spaniels will always perform to expectations, and they will remember all the commands easily. Their intelligence and alertness, coupled with good training and exercise, make them a good breed to have, and they are perfect for joining dog shows and sporting events.